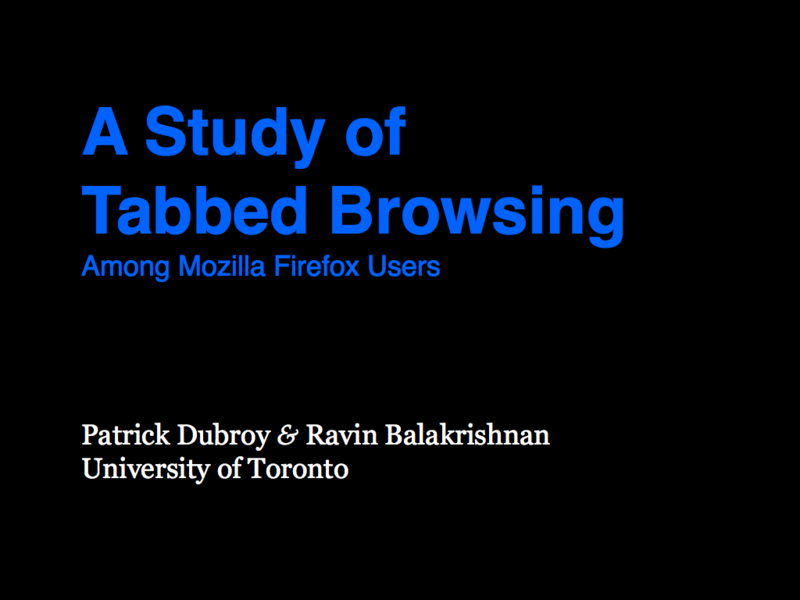 Last week, I went to Atlanta for CHI 2010 to present my paper A Study of Tabbed Browsing Among Mozilla Firefox Users. For those who couldn’t be there, or just don’t feel like reading a 10-page academic paper, here’s a transcript-by-memory of the talk. If you want a Cole’s Notes version, just check out the summary. I have a problem with tabs. On one hand, I find them amazingly useful, and don’t think I could ever go back to using a browser that doesn’t support tabs. But on the other hand, my browser usually looks like the one above. I have so many tabs open that the tab bar is scrolling. The tab titles are too small to read. I have some pages open in duplicate tabs. It’s generally just a big mess. 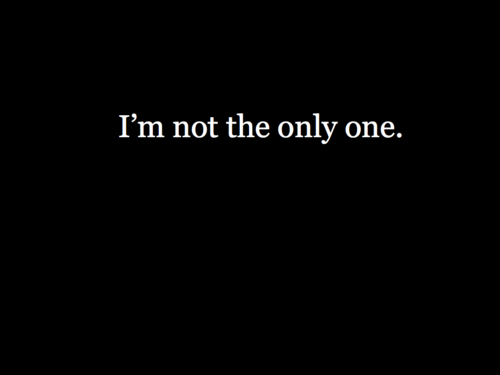 When I spoke to my friends and colleagues, I realized that I wasn’t the only one who has this problem. 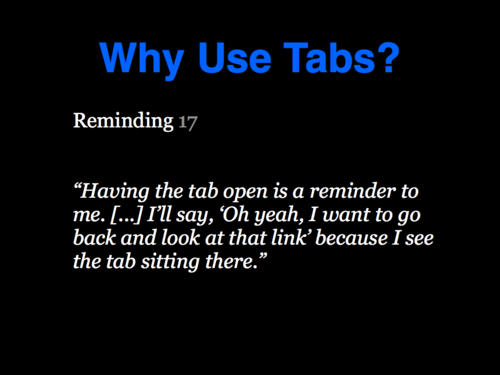 In order to fix the problem, I think it’s important that we understand how and why people use tabs today. I did some research, and although I could find several studies that had looked at web browsing behaviour (e.g., Catledge & Pitkow, Cockburn et al., and Obendorf et al. 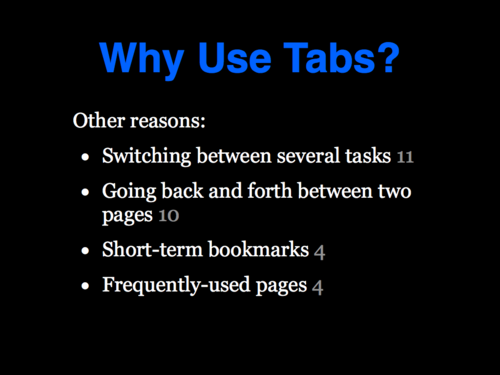 ), I couldn’t find very much data about how people use tabs. So I decided to do a study myself. The study was conducted with 21 participants over the course of approximately two weeks each. 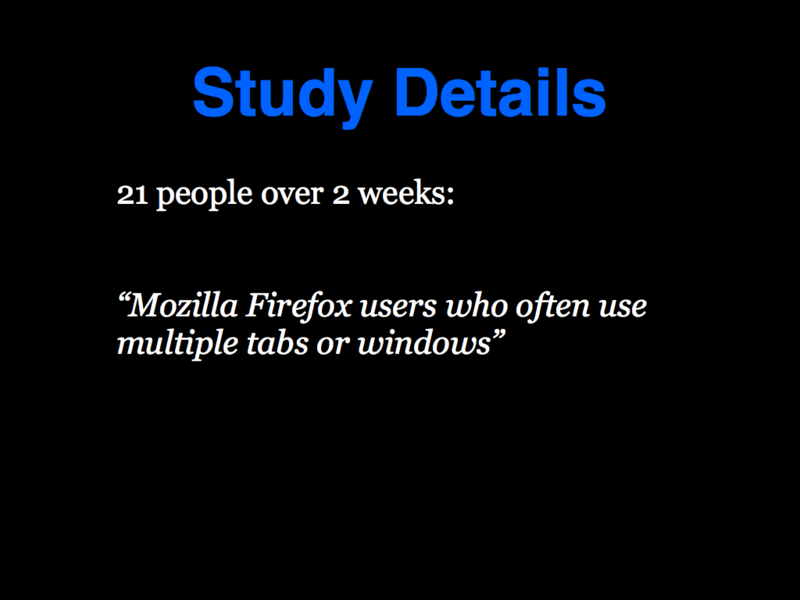 In our call for participation, we asked for “Mozilla Firefox users who often use multiple tabs or windows.” You’ll notice that I said “tabs OR windows”, and up to this point I haven’t mentioned anything about windows. 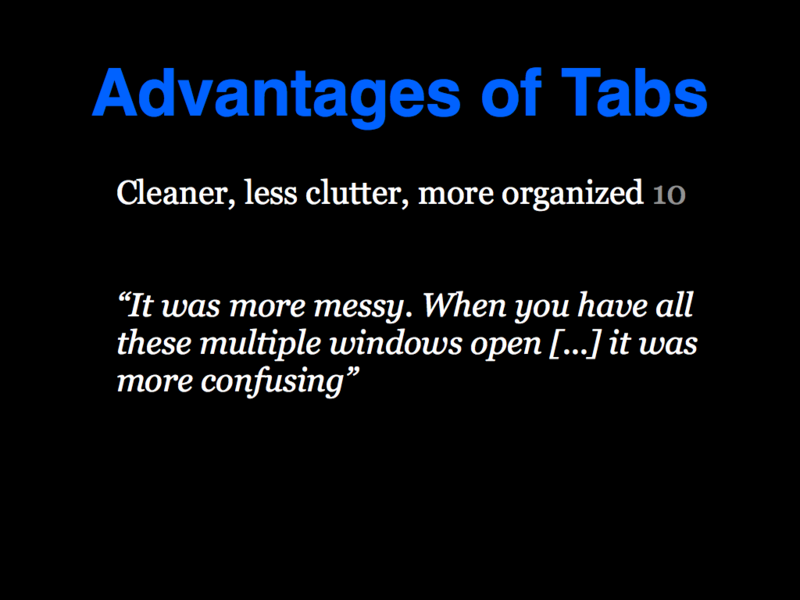 In many ways, tabs and windows serve the same purposes. You can open up links in multiple windows, and switch between them in any order, just like you can with tabs. 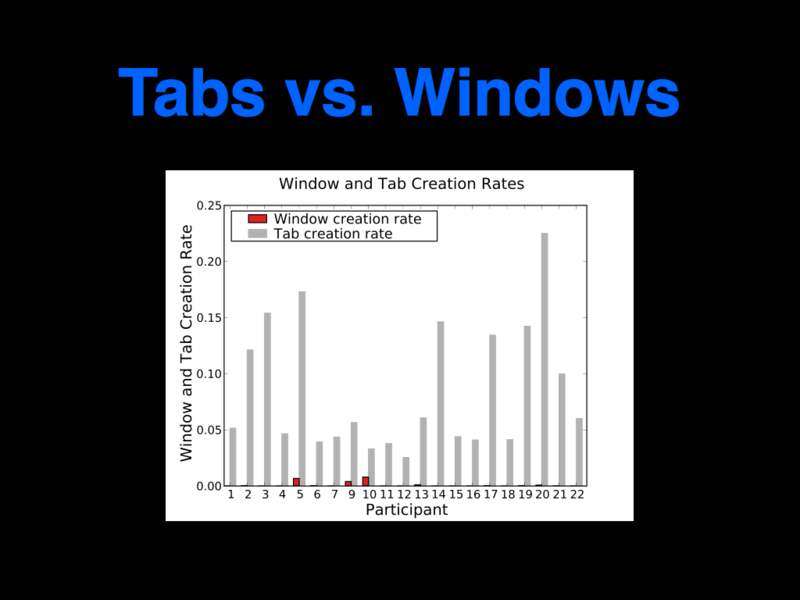 Although we were most interested in how people use tabs, we felt that there was also a benefit to studying people who use multiple windows. 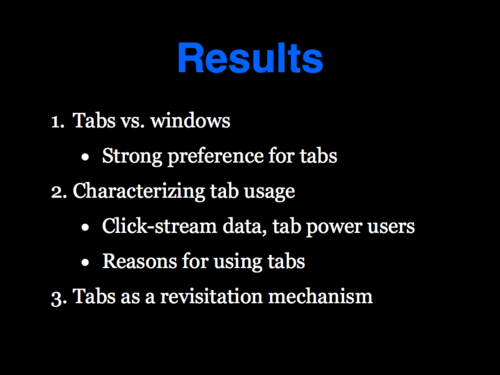 However, all but one of our participants showed a strong preference for tabs. In this study, we gathered both quantitative as well as qualitative data. The quantitative data was gathered through a Firefox extension I wrote called tlogger. Tlogger records click-stream logs—essentially, all network events, along with everything interesting the user does: clicking links, using the back button, opening, closing, and switching tabs, etc. In order to get a natural representation of their browsing behaviour, we felt that it was important that the actual URLs they visited were not visible to us. They were anonymized so that we could tell whether two URLs were from the same site or different sites, but we couldn’t see what the sites were. The qualitative data was gathered in two ways. First, tlogger would periodically prompt the participants to record a short diary entry, explaining what they are doing, what tabs they have open, and why they have them open. 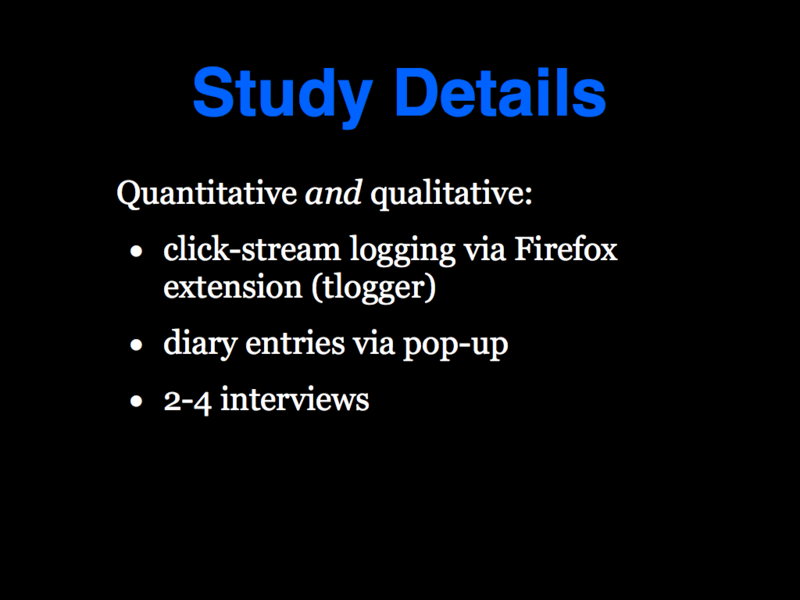 Second, we interviewed each participant 2-4 times over the course of the study. In these interviews, we asked some prepared questions, and also just generally talked to the participants about how they use tabs. Also, if we noticed any interesting comments in their diary entries, we also asked them for further detail on those. Rather than presenting the quantitative and qualitative results separately, we’ll take a more holistic approach, and look at the results from three angles. First, we’ll compare our participants’ usage of tabs to their usage of windows, and show that all but one of them showed a strong preference for tabs. 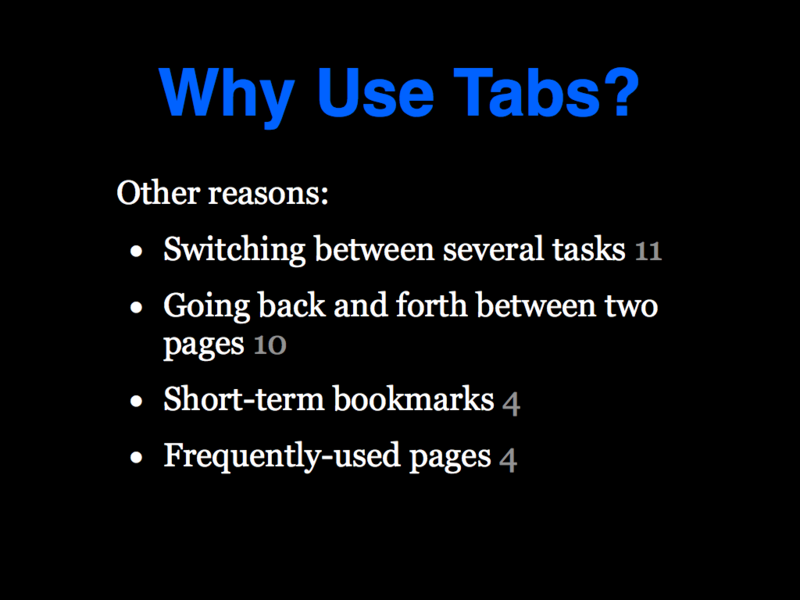 We’ll also discuss why they preferred tabs. 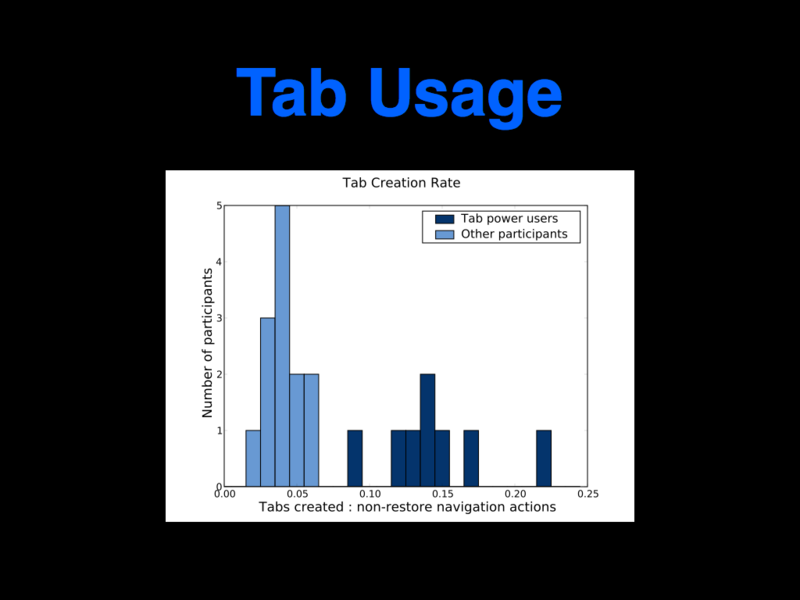 Second, we’ll take a closer look at the tab usage of our participants, and talk about a subset who used tabs much more frequently than the others—the so-called “tab power users.” We’ll talk about the reasons our participants gave us for using tabs, and talk about one key difference between the tab power users and the other participants. 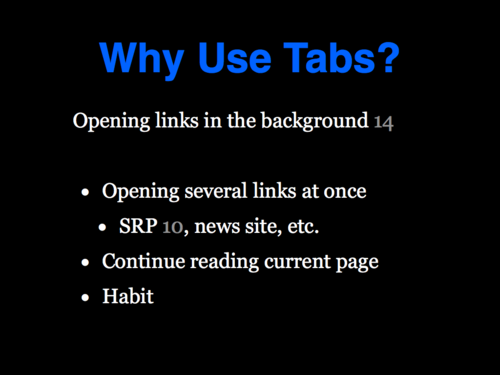 Finally, we’ll take a look at the use of tabs as a revisitation mechanism—as a way of getting back to pages that have previously been seen. Tabs offer a kind of revisitation that is similar to, but different from, the browser’s conventional revisitation mechanisms (the back button, bookmarks, and the history). Before we get into the results, let’s talk about how we measured tab and window usage. 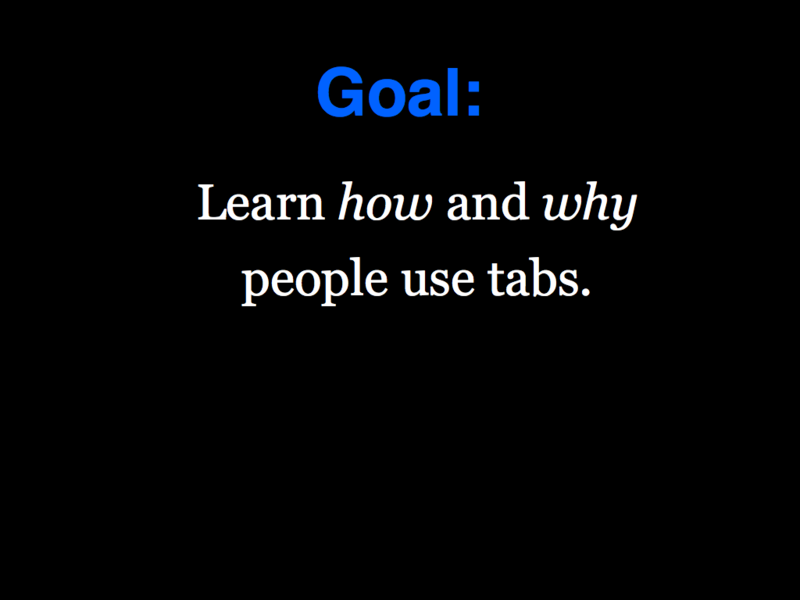 We could take a time-based approach, and look at the number of tabs created per hour. The problem with this is that it’s difficult to tell exactly when a person is using their browser, versus when it is just sitting idle. Instead, our unit of measure is a navigation action. A navigation action is considered to be any time the URL changes. 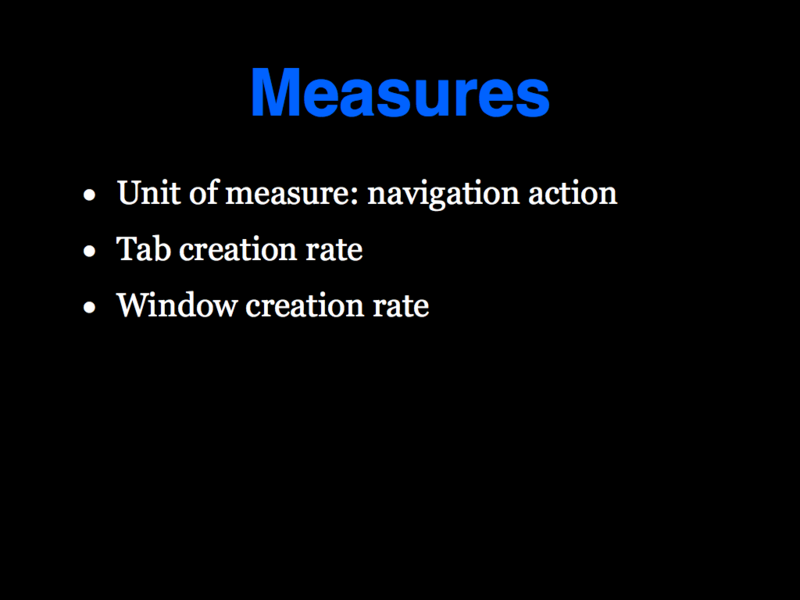 We measure the tab creation rate as the number of tabs created per navigation action. The window creation rate is defined similarly. I should note that we only count additional tabs and windows that are created. We don’t count the first window that is opened when the browser starts up, nor the first tab that is created in a window. Ok, with that out of the way—let’s take a look at tab and window usage. 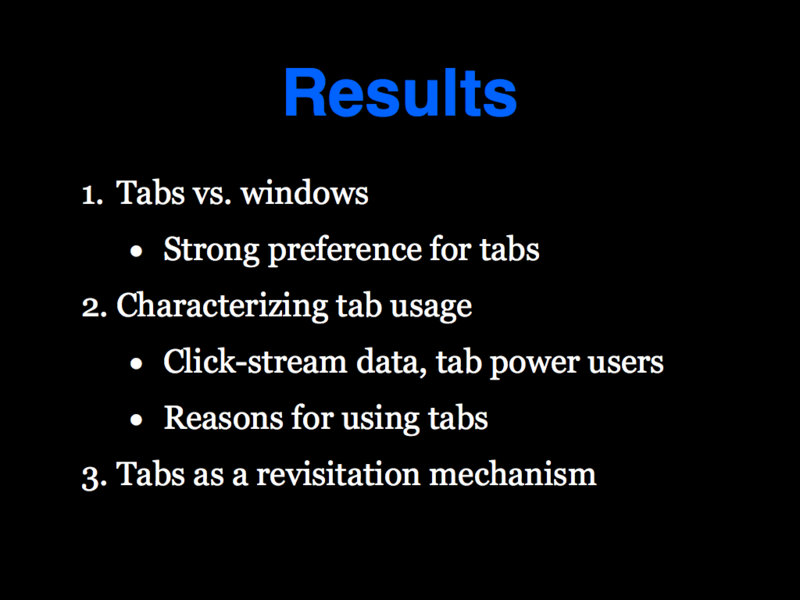 As you can see, most participants used tabs a lot more than they used windows. Only one participant—Participant 10—used windows more than tabs. But let’s take a closer look at the window usage. There are several ways that a window can be created. Sometimes, it’s purposely by the user, such as by hitting Ctrl-N or right-clicking on a link and selecting “Open Link in New Window”. Other times, the web site itself causes the new window to be opened. So what if we only look at windows that were created intentionally by the user? When we do that, window usage drops off pretty dramatically—only three participants show any real window usage to speak of. Now, to be fair, let’s do the same with tab usage. We see a pretty substantial drop-off for some users, but overall, there’s still a lot of intentional tab usage. Participant 10 still used more windows than tabs, but only slightly. Everyone else used a lot more tabs than windows. *Despite the fact that our call for participation asked for people who either used multiple tabs or multiple windows, what we got was mostly people who preferred to use tabs. 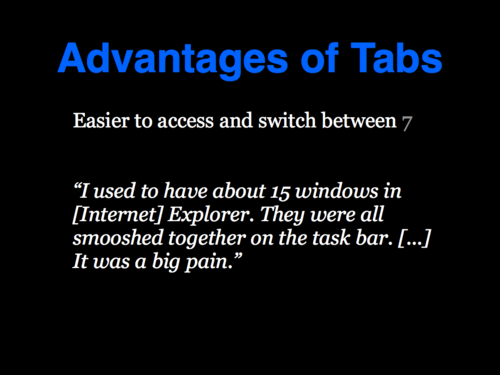 We asked our participants why they preferred to use tabs instead of windows. 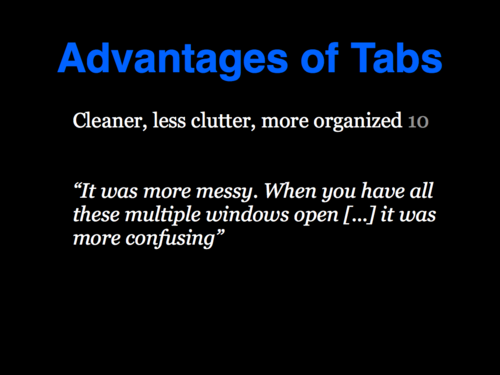 The most commonly cited reasons were that tabs are cleaner, less cluttered, or more organized than using multiple windows (cited by 10/21 participants) and that tabs are easier to access and switch between (mentioned by 7 participants). You can see that we have a bi-modal distribution. We’ve got 13 participants clustered around the 0.04 mark, i.e. 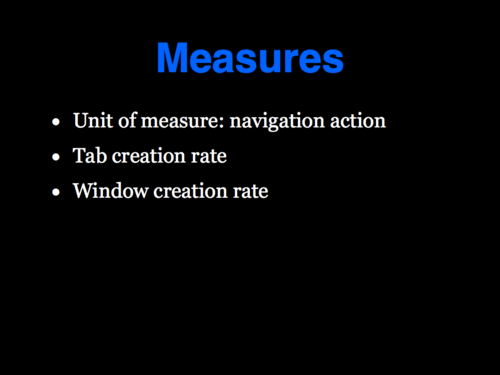 four tabs created per 100 navigation actions. And then we’ve got another 8 participants loosely clustered around 0.14, or 14 tabs per 100 navigation actions. We called this second group of people the “tab power users”. They created about 3 times as many tabs as the others. 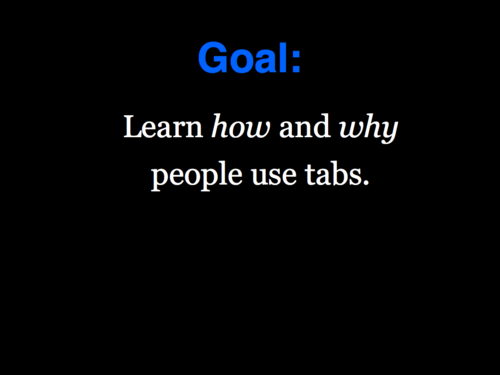 Although I didn’t mention it in my talk, if you’re interested in a closer look at how many tabs people used, you should take my earlier post: How many tabs do people use? (Now with real data!). 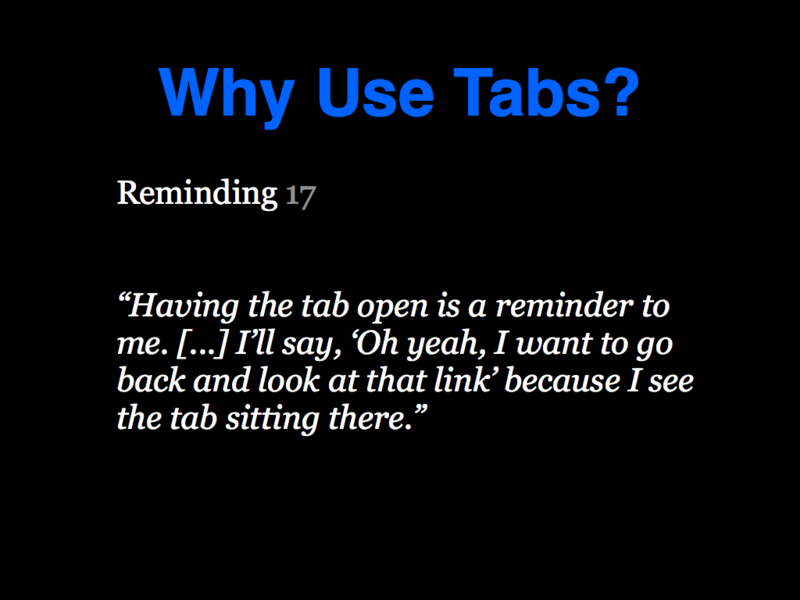 In the interviews, we asked our participants why they used tabs. In what situations are they useful? 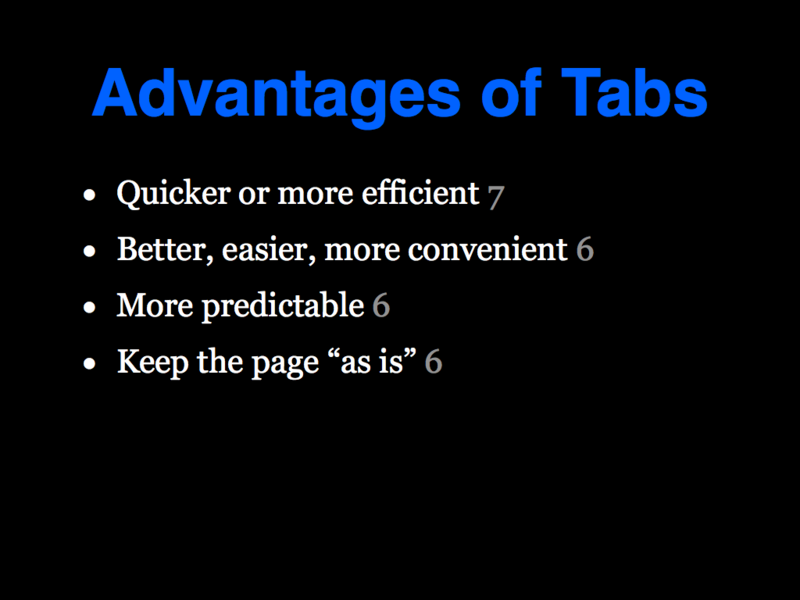 What are the advantages of using tabs? 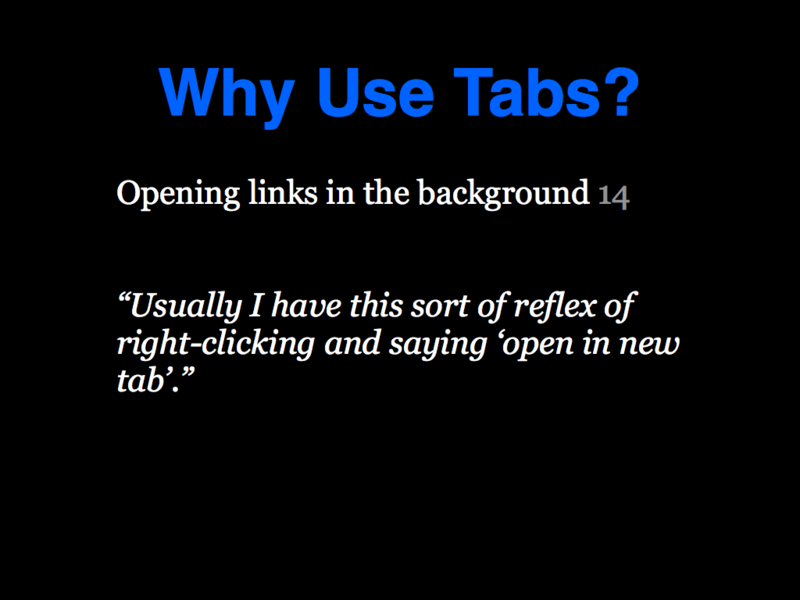 The second most commonly cited reason (by 14/21 participants) was the ability to open links in the background. For example, 10 participants mentioned that on a search results page, they like to open several of the results in new tabs, and then go look at them. Some people mentioned doing something similar on news sites like Google News or Digg—they’d scan through the list of articles, open any interesting articles in new tabs, and then go and read the articles. 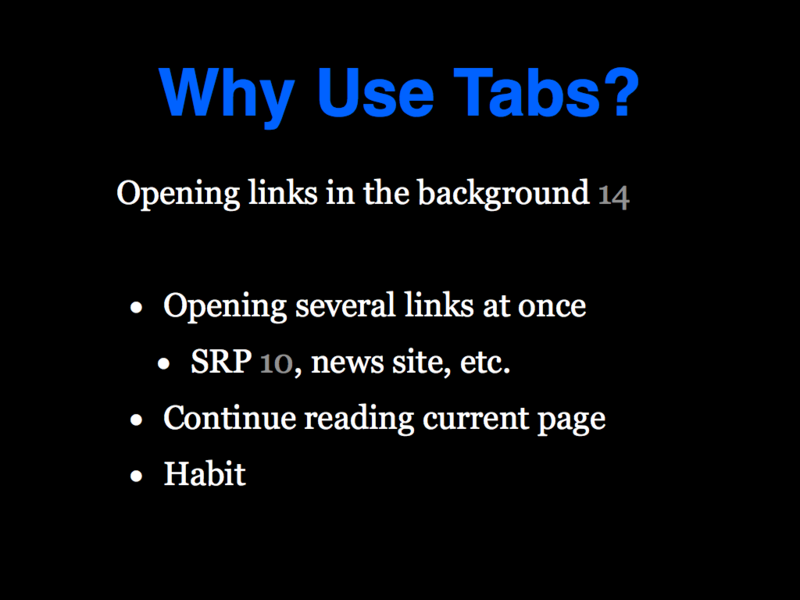 In fact, it turned out that every single one of the tab power users, and none of the other users, reported that opening links in a new tab had become habitual. 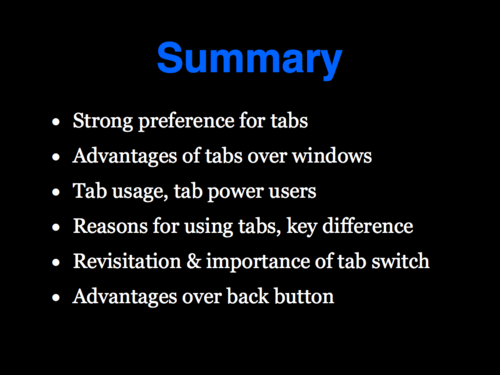 And this was something that we learned after we identified the tab power users. 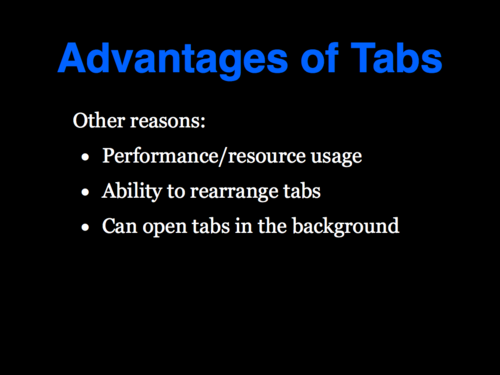 So this is likely a key difference between the tab power users and the other participants. There’s one thing that all of these reasons have in common: they are all about revisitation. Tabs offer a kind of revisitation that is different from the conventional revisitation mechanisms of the browser (the back button, bookmarks, and the history). The main difference is that when you switch back to a tab, the page is not reloaded. The green bars represent tab switches (as a percentage of navigation actions). The dark green are tab switch revisitations—switching back to tab that they’ve already been on. The light green bars represent the first time a tab is switched to. The red and the pink bars represent conventional revisitation, with back button use in red. The reason we’ve focused on back button use is that previous studies (e.g., Catledge & Pitkow, Cockburn et al., and Obendorf et al.) have consistently shown that the back button is the most frequently used revisitation mechanism, and is the second most frequently used navigation mechanism in the browser, after link clicking. 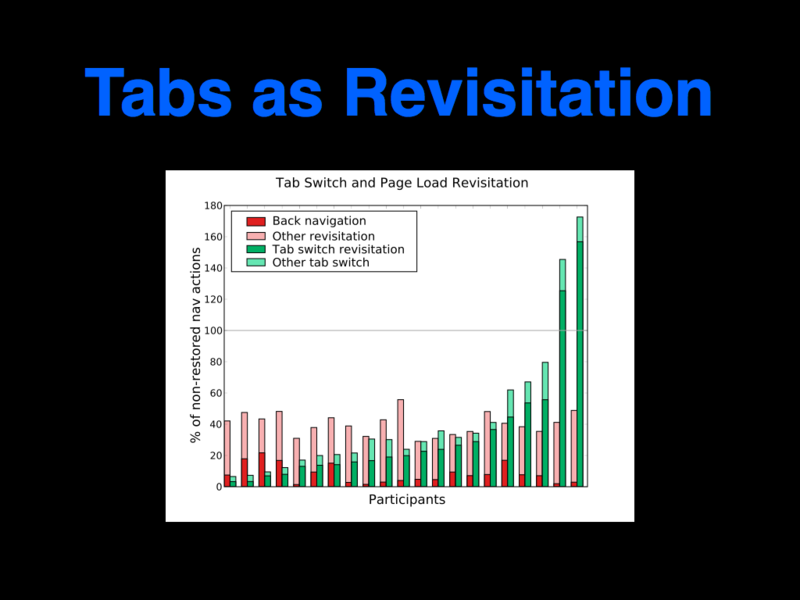 We can see from this chart that 16 of our 21 participants used tabs for revisitation more often than the back button. 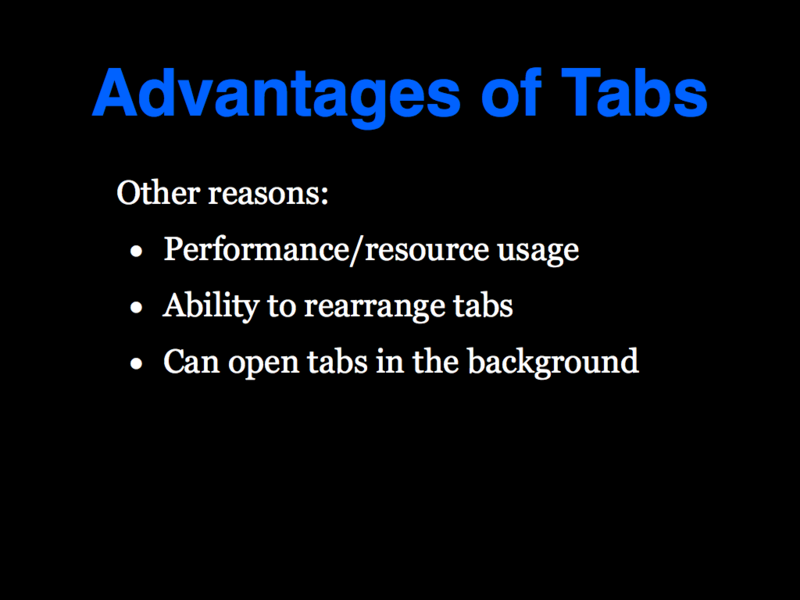 So, clearly tabs are often used for revisitation reasons. But also, for frequent tabs users, tab switching is the second most frequent thing they do in the browser. 6 people said they liked that tabs leave the page “as is”. If you’ve typed data into a form, or scrolled to the bottom of the page, it will be exactly as you left it when you switch back. This is not always true with the back button. 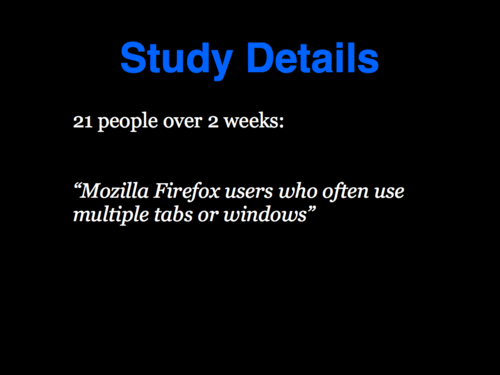 Despite our call for participation asking for Firefox users who either use multiple windows or multiple tabs, 20 of our 21 participants showed a strong preference for tabs. 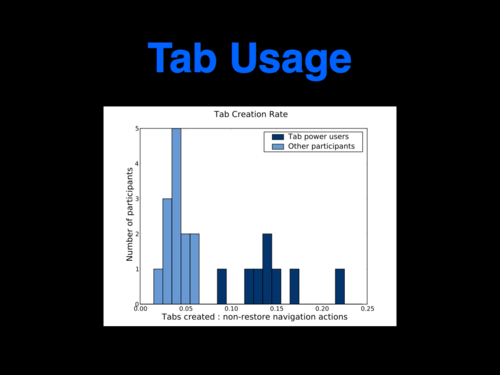 We took a closer look at the tab usage of our participants, and talked about a subset of participants who used tabs about 3x more than the others. 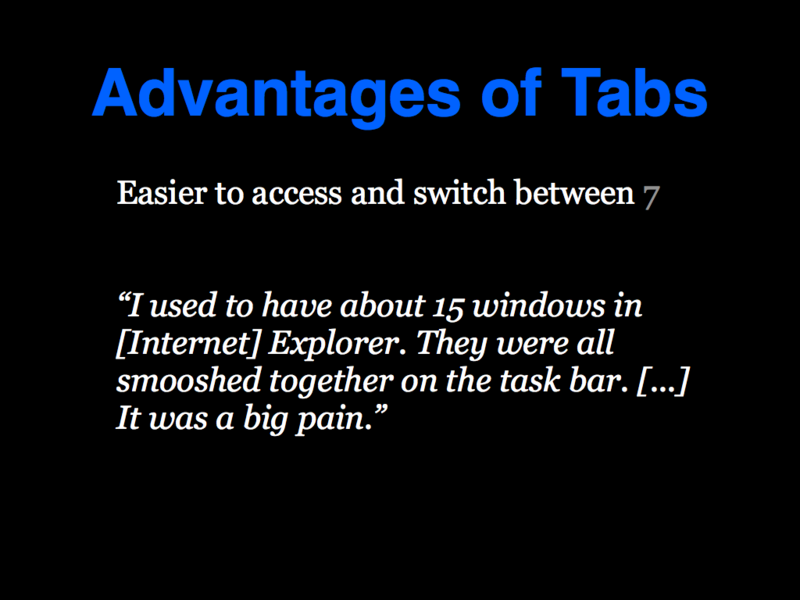 We called these people “tab power users”. Reminding (mentioned by 17/21). Leaving a tab open serves as a reminder that further action is required. Opening links in new tabs (14/21). This was done in order to open several links at once, or to open a link and continue reading the current page. We identified one key difference that separated the tab power users from the others—the tab power users habitually opened links in new tabs. 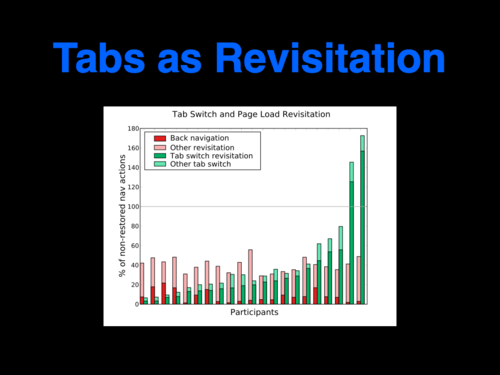 We showed that tabs are often used for revisitation, and that, for ¾ of our participants, tab-based revisitation was used more often than the back button, making tab switching the second most frequent thing they do in the browser. 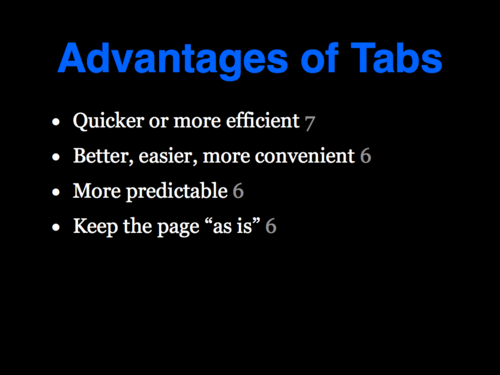 Tabs are more predictable than the back button (6/21), because you don’t always know how many times you’ll have to hit the back button to get back to your page. Tabs leave the page “as is” (6/21), including any data entered into a form, and the scroll state of the page. This is not always true with the back button. Now that we have this data, what can the browser designers take away from it? How can Mozilla (as well as Microsoft, Google, and Apple) use this to improve their browsers? 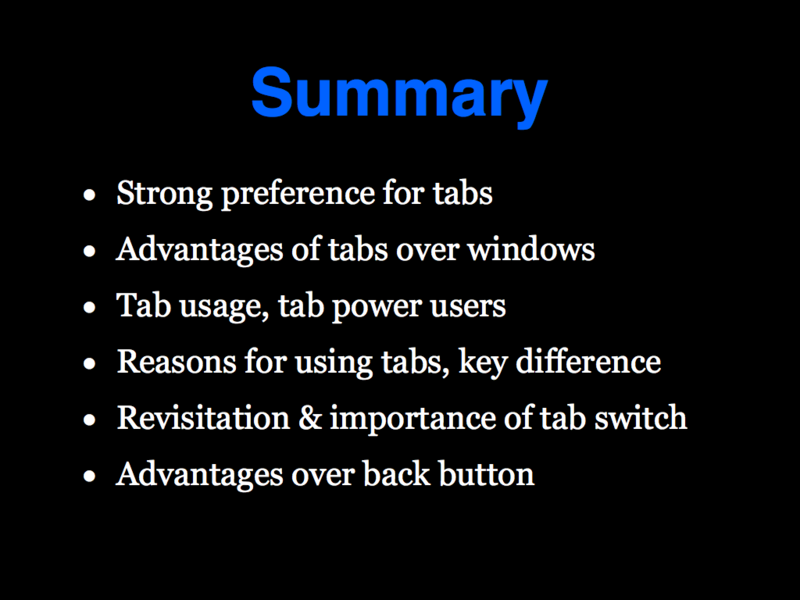 We identified several common usage patterns for tabs, and it would be interesting for browsers to include explicit support for these. It would be great if I didn’t have to keep 10 tabs open to remind me of various things. 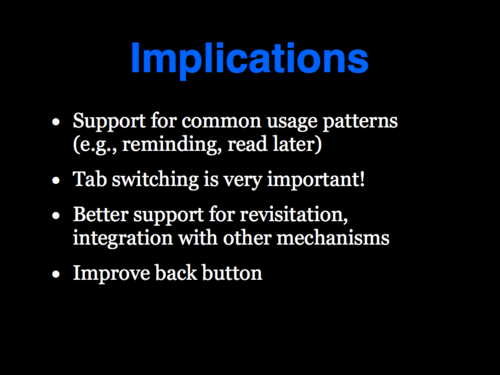 We showed that for people who often use tabs, tab switching is a very important activity, and I’d love to see some thought put into how we could optimize for that. Since tabs are often used for revisitation, it would be nice to add better support for tab-based revisitation, and better integration with the conventional revisitation mechanisms of the browser. For example, when I open a link in a new tab, the back button is disabled in the new tab. Why not inherit the back button stack from the previous tab, or maybe even just close the new tab and take me back to my old one? We mentioned several advantages of tab-based revisitation over using the back button. These point to ways that the back button could be improved, possibly allowing us to use fewer tabs. For example, I’d love it if I could feel confident that the back button would always save form data and the scroll position of the page. If you’d like more detail on this study, please take a look at the full paper from CHI 2010. If you have any questions, feel free to send an email to pat at the domain dubroy.com. 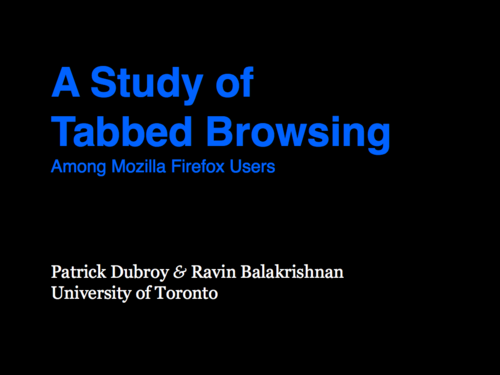 Also, if you’re interested in doing research with Firefox, I’d encourage you to take a look at tlogger, the extension I wrote for this study. It’s already been used in two other projects: the TabViz project, and the Multitasking bar paper presented at CHI 2010. I’m happy to answer any questions about the code and how the extension works. Great study, and glad to see someone presenting these issues. However, in reading this I sense an implicit assumption that I don't think is completely valid. I don't think windows vs. tabs is an either/or thing. Just so happens that right now I have four windows open in Safari and in the active window I have 20 tabs open. 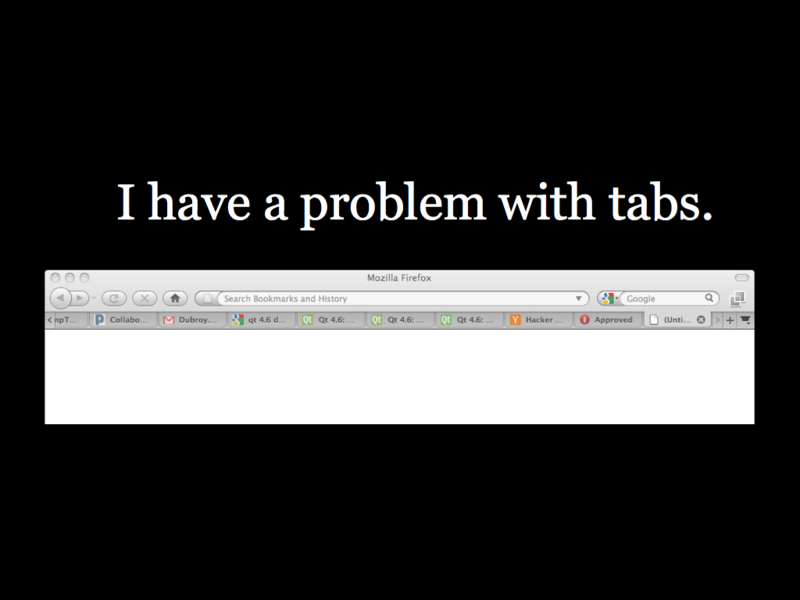 As for tabs, my usage is mostly exactly what you've discovered. OTOH I usually open new windows when I don't want to stop reading the page I'm currently on but want to quickly read something related and then get rid of it. I see this pattern often when surfing Wikipedia and want to follow a link to quickly see it and then I close the windows. I could even use a pop-up modal browser here, but one that could easily be converted to a tab if desired after opening. There are other reasons I use windows I'm sure but none come to mind as I write this. FYI I use Safari mostly because I'm currently on a Mac and it's the fastest browser and also because I love the "Top Sites" view that displays (on my screen) the last 12 sites in a curved 3D view. I like this so much I won't consider Chrome or Firefox. As for ideas I'd love to have the "Top Sites" view allow me to "pin" pages in the view (for revisitation) and also create stacks of pages, also for revisitation. In those stacks I'd like to be able to drill down and use breadcrumbs to get back up to the top level. I'd like to be able to open a stack into a browser window displayed as tabs and also be able to take all current tabs and collapse them down into a named stack. My most common use cases for a stacks would be to collapse all tabs and also to create them when I do a Google search. I'd love to be able to simply click visible checkboxes on a page with links, collect all those pages as a stack and then have them load in the background. What's more, I'd like the most recent version I viewed to be saved in the browser cache and to load it as previously viewed at the same viewport and cursor location. Maybe there could be a color coded "aging" indicator showing how long it's been since the page was last loaded so that with a glance I can tell if I should reload it. As much as possible I want to minimize the amount of right-click menu navigation required to work with these things. Give me things to just click, like tabs, and give me menus that appear on-hover, like underneath a tab. Also, the browser should ALWAYS, ALWAYS, ALWAYS give priority to the mouse cursor and the keyboard and NEVER give priority to a background task. If I'm doing something suspend everything else until I'm done doing something. Don't make me wait to type of click. Mike, you're absolutely right. It's not necessarily an either-or thing. In the paper, I discuss how some participants gave reasons when it can still be useful to use windows sometimes, even though they generally prefer to use tabs. The tab titles are too small to read. I've installed a JetPack that closed duplicate tabs, that helps a lot. That said, I'd have to have history duplicated to new tabs, sometimes the fact that the tab has no history, reminds me why I've got it open. I often need to compare content or copy-and-paste between 2 tabs. Good tabs auto-tiling could be an alternative to "tab switching" in that case. With larger and larger screens this could become usefull. Really good study. I often use Tabbed browsing in Firefox and I love the fastness of opening the webpages when compared to traditional style of multiple page browsing. Tabbed browsing puts less memory load on OS. Rearrange of similar content, fast switching and above all BULK Bookmarking is greatest advantage of Tabbed browsing. We can able to "Bookmark all Tabs" in a single click and also we can able to SAVE SESSION for future browsing. Firefox also implemented SAFE MODE browsing, which helps us to regain our browsing tabs easily if the BROWSER crashes suddenly with some exception. Thanks to Patrick for wonderful case study. I'm a tab power user, and will say that I can't work without two Firefox extensions that I feel should be built into the browser interface: Tab Scope, and Tab Mix Plus. Tab Scope pops a little tab preview on mouseover and includes a few very handy tools - back and forward (browser actions), reload page, stop, enlarge preview, and close the tab. Other extensions present the tabs together in a "3D curved" view as someone mentioned earlier, but I've never found it to be as useful as Tab Scope, especially because I can already see all the tabs and their icons. 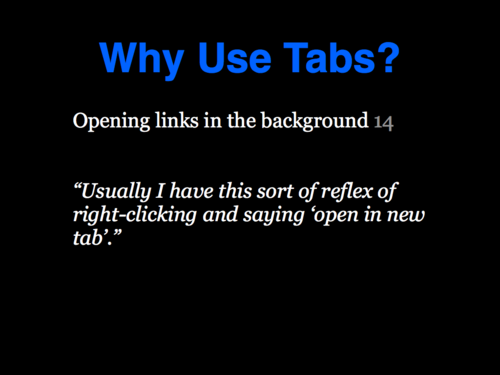 Tab Mix Plus gives the user complete control over when to open a new tab, a new window, or reuse the current tab or window; what happens when a tab opens, receives focus, closes, or merges; what a tab looks like when it has focus or is read/unread; what the tab bar looks like and how to handle more tabs than will fit in one row (I use multi-row, but some people prefer scrolling); mouse gestures and left-middle-right mouse click actions; which of 27 commands to show in the tab context menu, main context menu, and what to show in the tools menu. It also includes a configurable session manager. It's important to me to easily see which tab on the tab bar is currently in focus and which ones I haven't visited yet, but I also love being able to tell the browser to always open links, history, bookmarks, addresses, etc., in a new tab and always open new tabs next to the current one (whereas I believe the Firefox default is to open them at the end of the tabs). I'm so accustomed to having this total control over my browser tabs -- so accustomed to making the tabs behave in ways it appears the browser designers didn't consider for usability -- that when I use a different browser, such as Chrome, the experience feels wrong, even frustrating.